Best Pumpkin Bread Pudding Ever! I call this the Best Pumpkin Bread Pudding Ever because it’s one of my favorite comfort foods. I love the combination of pumpkin, pumpkin pie spice, coconut, and cranberries. Pumpkin cranberry bread pudding is a terrific alterative to traditional Thanksgiving pumpkin recipes like pie. It also makes a decadent, but not too unhealthy breakfast or brunch treat when family is visiting from out of town. This fall pumpkin recipe makes a huge amount of Best Pumpkin Bread Pudding Ever – terrific for big Thanksgiving togethers! However, if you’re making this for dessert for a small group and don’t want a couple of weeks of leftovers, cut the recipe in half. This easy pumpkin bread pudding recipe can be made gluten free (or not) depending on the type of bread you use. You can use gluten free wheat bread, white bread, or even raisin bread for extra deliciousness! If your bread isn’t stale, just cut up the bread, place the pieces on baking sheets and place in a warm oven until the bread is lightly toasted. Feel free to substitute dried cherries or raisins for the cranberries when making pumpkin cranberry bread pudding. Or you can use half shredded coconut and half dried cranberries or another dried fruit. 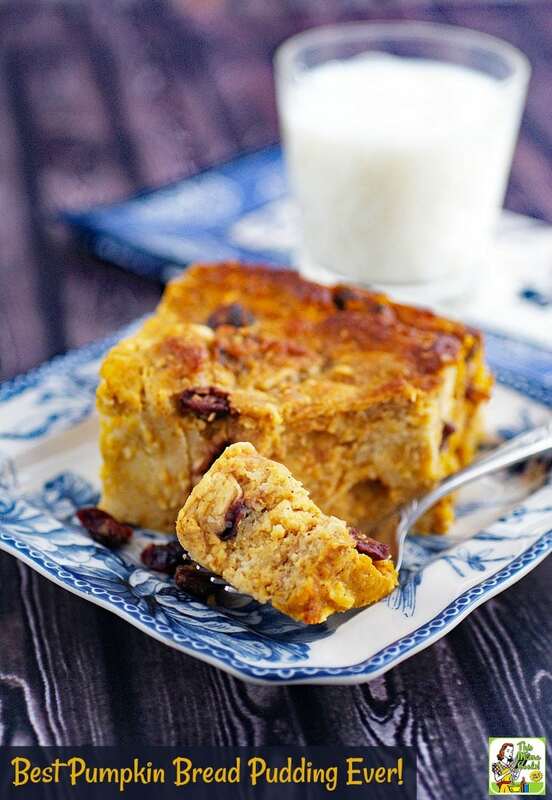 This easy pumpkin bread pudding can be made dairy free by substituting unsweetened coconut milk for the skim milk and a can of coconut cream for the evaporated milk. 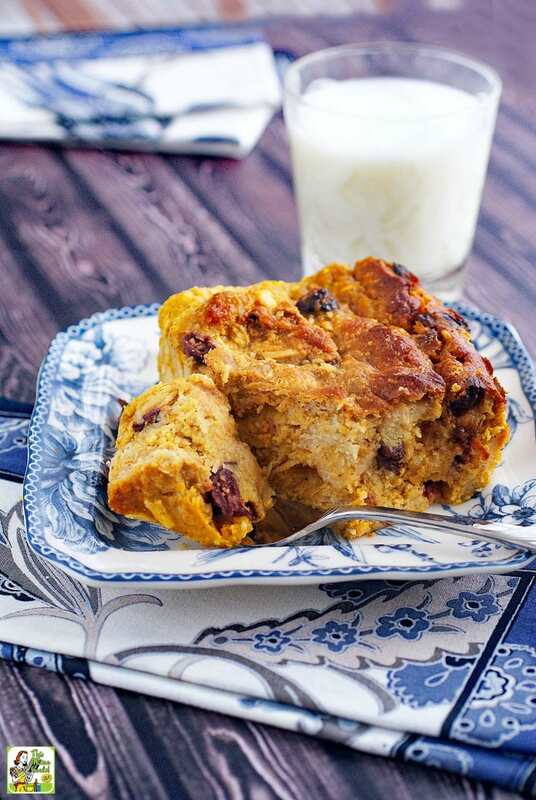 Serve this Best Pumpkin Bread Pudding Ever with whipped cream, a scoop of soy, coconut or regular ice cream, or whiskey sauce if you’re not watching the calories. Slices of pumpkin and cranberry bread pudding reheat very well in the microwave, but they’re delicious cold, too. 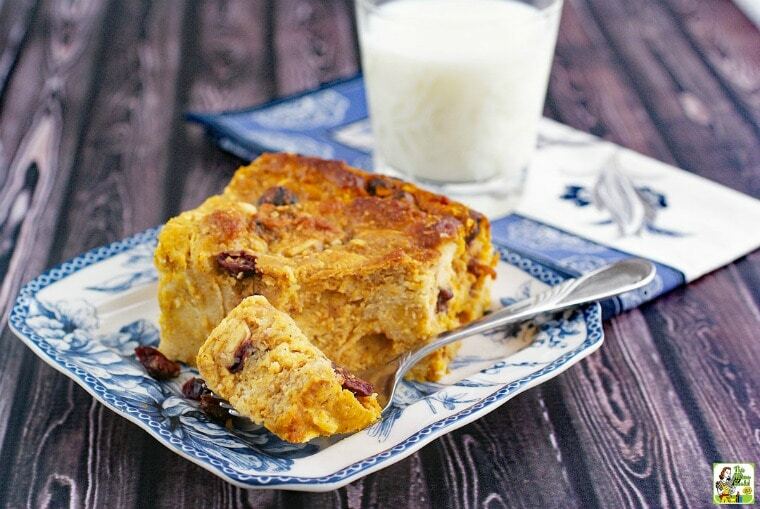 You can also make this easy pumpkin bread pudding several days ahead. Just cover with aluminum foil, refrigerate, and reheat in a microwave (by the serving) or the whole pan in a 325 degrees F oven for 15 minutes. 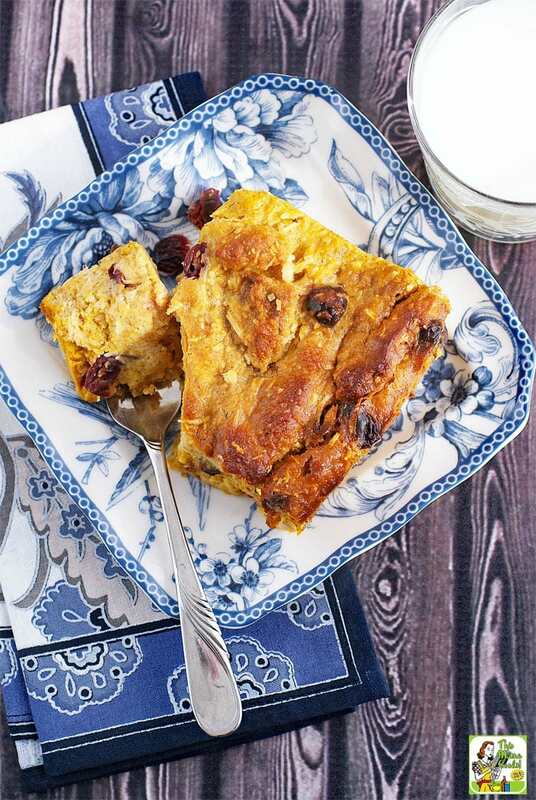 To make your pumpkin and cranberry bread pudding super moist, you must cook it in a bain marie or hot water bath. The moisture from the water creates uniform heat around the food. The bain marie also prevents the bread pudding from getting dried out or rubbery. It’s an extra step, but it’s worth doing. 1. Find a baking dish that is larger than your 2-quart baking dish. 2. Place your baking dish containing the bread pudding inside of the larger baking dish. 3. Fill the larger baking dish with 1/2 to 1 inch of water. 4. Open the oven door then carefully lower the dishes into the oven, close the door and bake. Spray the inside of a 2-quart baking dish rectangular baking dish and set aside. Cut or tear bread into 1/2 inch pieces. You should have about 10 lightly packed cups of bread pieces. Place in a large bowl. Cover bread with dried cranberries. In a medium bowl whisk eggs and egg whites. Add vanilla, pumpkin pie spice, salt , sugar, skim milk and condensed milk to eggs and whisk until blended. Pour egg, spice and milk mixture over bread and cranberries. Mix together bread and liquids until bread is saturated. Let stand for 30 minutes periodically pressing the bread down with a spoon or spatula to help bread absorb the liquid. Baked the pumpkin and cranberry bread pudding in a bain marie (water bath) until puffed and firm in the center - about 1 1/2 hours. Serve warm or cold, either plain or with whipped cream or ice cream. Originally published on October 20, 2011. Updated with new pictures and information. Posted in Baking, Breakfast, Desserts, Gluten Free, Recipes, Thanksgiving and tagged bread pudding, cranberries, Halloween, pumpkin on November 2, 2017 by Anne-Marie Nichols. I’d be surprised if you can’t hear my stomach rumbling just from looking at this. SO perfect- NEED to try!! Thanks Karly! I loves me a good bread pudding! This looks awesome; could I sub soy milk? Love the site. It is very well-organized! I’m sure you can use soy milk or any other type of “alternative” milk. Using vanilla flavored soy would be delicious, too! Thanks so much for linking up your pumpkin recipe to 5 Flu-Fighting Foods! What a wonderful seasonal dessert! This looks yummy! I love the color of the berries!